This year marks the 50th anniversary of the Undergraduate Library at the University of Illinois! As we prepare to turn as golden as the corn in the Morrow Plots, we’re eagerly planning for an awesome celebration in Fall of 2019. No UGL celebration would be complete without incorporating student creative voices, though, so we’re launching a special competition for aspiring graphic designers. 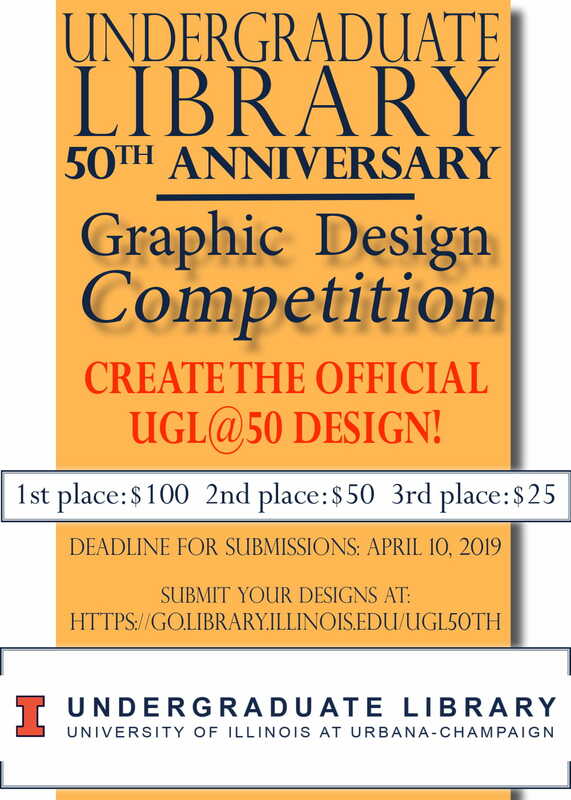 The UGL is inviting submissions for a commemorative graphic design which represents the look and theme for the UGL@50 celebration, and encapsulates the many roles the library serves in students’ lives. Prizes will be awarded to the designers of the top three designs. The first-place design will become an enduring part of the UGL’s digital identity and it will be printed on multiple forms of commemorative items including t-shirts, mugs, and other swag! In addition, the first-place logo designer will receive $100, free UGL swag with their design printed on it, and a special invitation to the 50th anniversary celebration taking place in Fall 2019. The second and third-place designs will receive $50 and $25 prizes. All submissions should reflect a relevant representation of the University of Illinois undergraduate student body, and should embody what the UGL experience means to you and your classmates. The design should celebrate elements from the past, present, and/or future of the UGL, should there be a future UGL. Designers should ask themselves how the UGL has affected their student experience and provide a design representative of their personal association with the library. Most of all, we want you to celebrate the longstanding of our underground gem! The deadline for all submissions is April 10, 2019. Winners will be notified by April 20th. Only current undergraduate students are eligible to compete. Any design shape is permitted, but should scale easily for a variety of formats – including print, digital, and physical items like t-shirt and coffee cups. Designers wishing to incorporate the official University of Illinois colors or ‘Block I’ into their design should refer to the University of Illinois brand guidelines. Only one submission permitted per artist. All entries must be submitted as PDF, PNG, TIFF, or JPEG images with high resolution. Designers are highly encouraged to save the original format. Submitting your artwork will provide the UGL with the right to use your work in promotional materials. You will receive credit and ownership as the content creator. For full contest and ownership details, see the content submission form. Read the full list of contest rules. Need help getting started? Check out the following resources for some information and inspiration! Please contact undergrad@library.illinois.edu with any questions. This entry was posted in UGL News and tagged anniversary, art, brand, cash prize, celebration, contest, creative, Design, Graphic Design, history, Illinois Library, jpeg, morrow plots, pdf, png, submissions, u of i, U of I Libraries, ugl, UGL@50, UIUC, undergrad, undergraduate library by Zander Miller. Bookmark the permalink.